Does Your Homeowners’ Policy Have This Important Rider? Most homeowners have their policy premium wrapped into their monthly mortgage payment, thus nearly forgetting about the policy altogether. That’s why, when it comes time to use your insurance, it can be confusing to understand all that your policy covers. That’s why you need to have someone at your side to guide you through the claim process. Sometimes storms can cause enough destruction to require replacement of the damaged area to prevent a bigger problem from happening, such as leaking. That being said, if your siding needs to be replaced and you have green siding, the damaged area will be replaced with green siding. 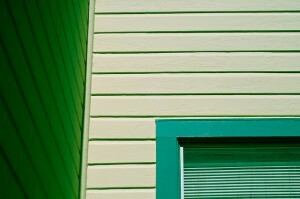 Sounds fair enough, until you realize the thousands of shades of green siding there are out there. The bottom line is, the insurance company doesn’t care whether or not your house is all one uniform color. They just care that the materials on your home are going to do their job, which is protect your structure from further damage. A Rider Worth Looking In To. It’s rare, but sometimes homeowners’ insurance policies can have a rider added onto them that ensures your new housing materials are matched with your existing materials. If your existing color can’t be matched, either due to fading or the material being discontinued, your insurance carrier will pay to replace all of your materials so that you end up with one color on your home. If you’re not entirely sure if your policy has this rider, be sure to call your insurance agent today. This will help us help you when storm damage hits your home! As a local contractor servicing the Northwestern metro area since 1972, we always go to bat for our clients to ensure they get what’s entitled to them. The Chuba Company is located in Elk River, MN. We hold an A+ rating with the BBB and are GAF Mater Elite certified contractors. With our Quality Workmanship Warranty, you can sit back and relax while we improve your home. Follow us on Pinterest, Facebook, and Houzz to see our past projects and quality craftsmanship!